(CNN) - President Obama shocked the White House Press Corps Friday afternoon when he crashed the daily briefing to announce Justice David Souter's retirement. The surprise appearance took a little maneuvering and a lot of discipline from administration staff not to leak. According to administration officials, President Obama was waiting for Justice Souter's letter to arrive to officially notify him of the retirement. But the letter didn't show up in time for Press Secretary Robert Gibbs to announce the news in his afternoon briefing. So Gibbs, after delaying the briefing for about 30 minutes, began his afternoon exchange with reporters anyway. He said he had no official confirmation that any Supreme Court Justice intended to step down. Then he went on to take reporters’ questions. WASHINGTON (CNN) - Justice David Souter announced Friday he will retire from the Supreme Court, after informing the White House of his plans. Souter, in a brief letter to the president, said "When the Supreme Court rises for the summer recess this year, I intend to retire from active service as a justice." The current term is expected to end in late June. President Barack Obama - breaking into the daily White House news briefing - thanked Souter for his service and said he will choose as his replacement someone who understands "the realities" people go through every day, and someone who understands "the rule of law." The president said he also will seek someone with a "sharp, independent mind" who has integrity and strives for excellence. He described Souter as "not only a good judge, but a good person," adding, "I'm incredibly grateful for his good service." "I wish him safe travels on his journey home and on the road ahead," the president said. What do you think of the two senators who represent your state? (CNN) - The Capitol is revamping its energy supply. The Capitol power plant will use natural gas as the primary fuel source for steam used at the compound to heat buildings and water, terminating its coal usage unless needed for emergency backup, according to a statement released by Democratic leaders of the House and Senate Friday. 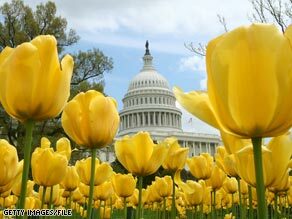 House Speaker Nancy Pelosi and Senate Majority Leader Harry Reid claim the switch will improve DC air quality and reduce Congress's carbon pollution impact, serving as an example for cleaner fuel usage across the United States. "The Congress of the United States should not only be a model for the nation, but also a good neighbor," said Pelosi. Senate Majority Leader Reid echoed the speaker's statement saying the "switch to cleaner burning natural gas shows that the House and Senate are leading by example in reducing our emissions." The Capitol architect in charge of the switch cited that the complex will revert back to coal usage in "abnormally cold conditions" or in the case of equipment outages. Podcast: Who will replace retiring Supreme Court Justice Souter? (CNN) – President Obama will pick his first Supreme Court Justice, after breaking into a White House press briefing and confirming Associate Justice David Souter's retirement after 29 years on the bench. In the latest installment of CNN=Politics Daily, CNN's Jill Dougherty takes a look at the president's options as he looks to name Souter's replacement. Plus: The GOP is bracing for a battle over the Supreme Court Justice's surrogate. CNN Senior Congressional Correspondent Dana Bash looks at conservatives' plans to fight the president every step of the way. Also: CNN Senior Political Analyst Gloria Borger has Republican-turned- Democratic Sen. Arlen Specter's take on the president's decision. Finally: Cuban-Americans are taking advantage of their new freedom to return to their homeland by celebrating May Day in Havana. But former Cuban President Fidel Castro is making a provocative claim that the United States wants Cubans to "return to the fold of slaves." CNN's Jim Acosta reports on the situation from the island nation. WASHINGTON (CNN) - Jill Biden is set to give the commencement address at Brooklyn's Kingsborough Community College graduation ceremony in June, according to a statement released by the White House Friday. Biden has been an educator for 28 years, and currently serves as an adjunct English professor at Northern Virginia Community College in the DC area. "Technology has profoundly impacted how – and where – we all consume information and communicate with one another. 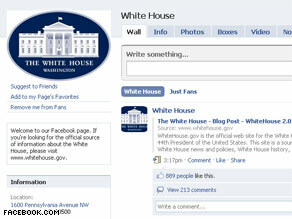 WhiteHouse.gov is an important part of the Administration's effort to use the internet to reach the public quickly and effectively – but it isn't the only place." (CNN) - Senate Minority Leader Mitch McConnell called on President Obama Friday to choose a Supreme Court nominee who is "able to fulfill the judicial oath of applying the law without prejudice, and not decide cases based on their feelings or personal politics." “I thank Justice Souter for his service and wish him well in his future endeavors once he leaves the Supreme Court.“I trust the President will choose a nominee for the upcoming vacancy based on their experience and even-handed reading of the law, and not their partisan leanings or ability to pass litmus tests. A Supreme Court nominee needs to be able to fulfill the judicial oath of applying the law without prejudice, and not decide cases based on their feelings or personal politics. President Obama will meet with the presidents of Pakistan and Afghanistan on Wednesday. WASHINGTON (CNN) – President Obama will meet with the presidents of Afghanistan and Pakistan on Wednesday to "accelerate the process of cooperation between the two countries," White House Press Secretary Robert Gibbs announced Friday. 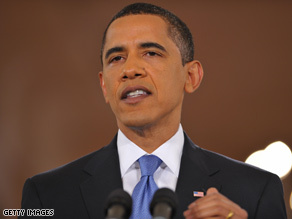 Obama will hold separate meetings and a joint summit with President Karzai of Afghanistan and President Zardari of Pakistan at the White House, Gibbs announced during Friday's daily press briefing. "The president looks forward to discussing with these two democratically elected leaders how we can work together to enhance our cooperation in this important part of the world as the United States implements a new strategy toward Afghanistan and Pakistan," Gibbs said. “Justice Souter has served the Nation with distinction for nearly two decades on the Supreme Court. I have admired his commitment to justice, his admiration for the law, and his understanding of the impact of the Court’s decisions on the daily lives of ordinary Americans. Throughout his career, he has been committed to the law and not to ideology. New Englanders treasure our strong sense of independence, and Justice Souter fits the independent Yankee mold. He has a first-rate legal mind. I have known him to be an honest and tireless person who has given years of his life in service to this country. “Of course, we have all known that his deep love for New Hampshire would take him away from the Court some day. Nonetheless, I am sad to see a gifted jurist, a dedicated public servant and a decent man leave the bench. We have long been neighbors in New England, and I look forward to seeing him at home. WASHINGTON (CNN) - Several members of the Republican National Committee are miffed at Newt Gingrich for claiming that they’re a small bunch of egomaniacs who need to be coddled by the party chairman. 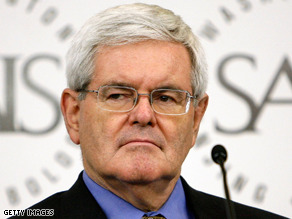 “Newt needs to take a breath,” New Jersey committeeman David Norcross told CNN. Gingrich made the assertion on C-SPAN Thursday when asked about a new resolution put forth by some veteran members - including Norcross and RNC Treasurer Randy Pullen of Arizona - that would limit chairman Michael Steele’s ability to control how the committee spends its money. That resolution has sparked a fresh round of infighting between Steele loyalists on the committee and entrenched members who backed other candidates for the chairmanship and remain skeptical of his leadership. “They all think they’re precious, and they all think they should be taken care of, and they all think the job of the chairman, first of all, is to make the RNC members happy,” Gingrich said of the committee’s 168 members. “Forming circular firing squads only gives aid to the Democrats who are doing quite nicely in undercutting the public trust in our government,” Smith said.